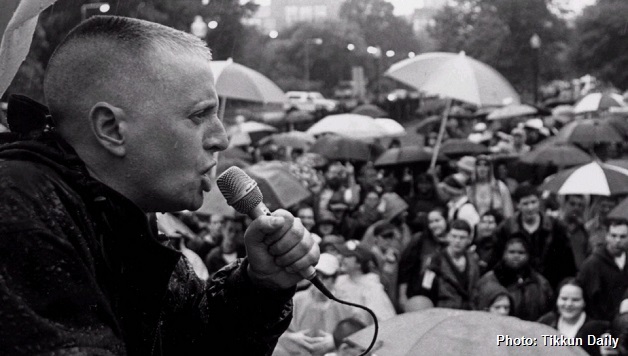 Feinberg’s writing and activism had a huge impact on many in the lesbian, gay, bisexual and trans (LGBT) communities. She was a powerful role model for many young lesbians, transgendered people, and people who reject oppressive norms imposed by this society. Feinberg was born in Kansas City, Missouri in 1949 and grew up in Buffalo, New York. In 1994 Feinberg published Stone Butch Blues, a powerfully written fictionalized account of her experience growing up as gender variant, in her case as a masculine “stone butch” lesbian in the violently repressive climate of 1950s Buffalo. An article in the Gusto blog of the Buffalo News describes the atmosphere Feinberg grew up in which she described in her book. After the huge union battles of the 1930s and 1940s, much of the U.S. industrial working class had won labor contracts that provided rising living standards in the 1950s. This was the industrial heyday of Buffalo. The city’s booming factories produced steel, airplane parts, and electronics. At the same time LGBT communities were violently oppressed. LGBT people were subjected to constant humiliation and ferocious attacks from the police and the public. Patrons of deeply underground LGBT bars and social spaces would frequently be arrested after police raids. People could be released from prison the next day without being charged with anything, yet they would often be “outed” in local newspapers for their “crimes.” In Stone Butch Blues, the protagonist, Jess, and her friends are forced to take a lesbian friend to a veterinarian for treatment after she was assaulted by a policeman and a hospital refused to treat her. While fiction, the book nonetheless reflected the prevailing social climate in the 1950s. While describing often harrowing oppression in Stone Butch Blues, Feinberg also portrays working-class camaraderie and a degree of solidarity transcending racial, sexual and gender identities. Feinberg became estranged from her biological family in her mid-teens and remained distant from them her entire life. As a gender variant person, it was difficult to maintain steady work. While her vocations were activism and writing, Feinberg supported herself throughout most her life with a succession of low-wage jobs including entering data, washing dishes, working in a PVC pipe factory, and cleaning ship cargo holds. While her writing made her influential in academia, Feinberg always felt a closer identification with the working class. For much of her adult life Feinberg was a member of the Workers World Party. While sharing the goal of a socialist world free of oppression, we in Socialist Alternative must also note our serious differences with the WWP including their support for a series of regimes in countries such as Iran and Zimbabwe which have viciously oppressed LGBT people. After Feinberg moved to New York City, she became active in many anti-war, anti-racist, and pro-labor campaigns. She was a prominent organizer of the 1974 March Against Racism in Boston, which was a campaign against violent racial attacks against African-Americans amid that city’s tumultuous desegregation. In 1988 Feinberg was one of the organizers in Atlanta that blocked the Klan as they tried to march down MLK Jr. Avenue on MLK Day. Working with Buffalo United for Choice and the Rainbow Peacekeepers, Feinberg helped lead up organizing in Buffalo several times in the tense atmosphere of the 1990s to defend women’s reproductive freedom and later to defend LGBT bars and clubs from expected attacks when right-wing elements grouped around “Operation Save America” began a crusade in Buffalo. In Buffalo the Rainbow Peacekeepers successfully organized LGBT people, straight supporters, bar patrons, and pro-choice activists to defend LGBT bars and other spaces from right-wing attacks using tactics of mass mobilization used in previous abortion clinic defenses without relying on the police. She believed in an inclusive definition of transgenderism and in alliances between all oppressed groups. Feinberg was active in the National Writers Union and Pride at Work, an LGBT group within the AFL-CIO national union federation. 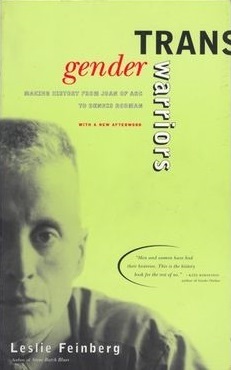 In 1997 Feinberg published Transgender Warriors: Making History from Joan of Arc to Dennis Rodman, a survey of transgender people throughout history. 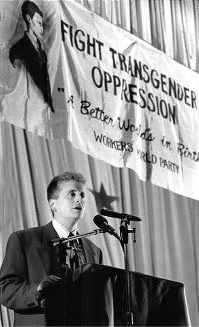 In 1999 Feinberg published Trans Liberation, a collection of her speeches on transgender liberation and its connection to other struggles. In 2006 she published a second work of fiction, Drag King Dreams, about a New York butch lesbian and her world of the mid-2000s. 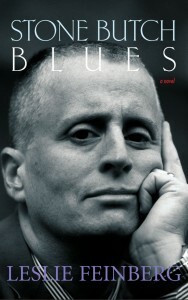 Feinberg’s books won many awards including the Lambda Literary Award and the American Library Association Gay and Lesbian Book Award. Feinberg met her partner, Minnie Bruce Pratt, in 1992 at a slideshow in Washington, D.C., outlining her transgender research. Pratt is an activist and poet who teaches at the University of Syracuse. For legal protection they had a civil union, a domestic partnership, and married twice, in Massachusetts, and in New York State in 2011. She often said that she felt the state had no right to determine who were or were not her loved ones. Feinberg struggled with illness over many years. Feinberg was infected with Lyme disease and other tick borne infections in the early 1970s when little was known about these diseases. She wasn’t diagnosed until 2007 and received treatment for these diseases only since then. She felt that earlier she had been denied proper medical care because of prejudice toward transgendered people as well as ignorance which had inhibited our understanding of Lyme and similar diseases. During periods when she could not read, write, or talk because of illness, Feinberg worked on a highly regarded photographic documentary of her Hawley-Green neighborhood in Syracuse shot entirely through her apartment windows which she posted online at Flickr. Feinberg was very active in the CeCe McDonald solidarity campaign. CeCe McDonald is a young African-American transgendered student who, in a plea bargain, was initially sentenced to 41 months in a male prison after defending herself from an attack by a neo-Nazi in Minneapolis in 2012. Feinberg had planned to release documentation of the grassroots campaign to free CeCe called, “This Is What Solidarity Looks Like” along with free access to a 20th anniversary version of Stone Butch Blues. Friends and comrades of Leslie are working are working to continue Feinberg’s project and to put her final writing and art online at Lesliefeinberg.net. We must honor Leslie’s lifelong contributions to social justice by fighting for the socialist society she always fought for – a society based on equality, diversity, mutual respect, and cooperation. Fight for Equality Is Not Over!